In April 1960, committee of Yarmouth Glen WI met with Yarmouth Township Council regarding a cleanup of Kilmartin cemetery. This resulted in a $50 annual grant given to the branch for upkeep and maintenance of the cemetery. At this time, all markers were removed and the ground leveled. Further funds came from card parties and the community. In 1962, good and repaired markers were positioned and cemented in place in a central enclosure. After seeding the grounds and for the 125th anniversary of St James Presbyterian Church, the cemetery was dedicated on June 25, 1963. The cemetery project was completed with landscaping and installation of a gate within a fenced area surrounding the markers. During Centennial year, 1967, two Crab Apple trees and a Copper Beech tree were planted. In 1991, for a FWIO project, an Ash and Linden were planted. 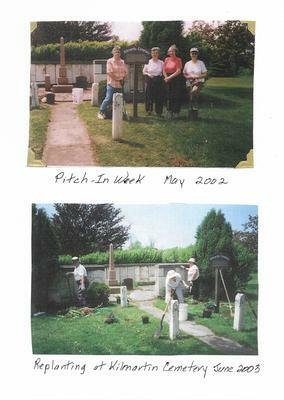 During Pitch In week, May 2002, branch members met at the cemetery with rakes, shovels and pails for a clean-up. The following June, 2003, new shrubbery was added. On October, 2004, a Red Maple and Silver Birch were planted by family members of Shirley Bechard and Betty Van Patter, in recognition of their community involvement and membership in WI. 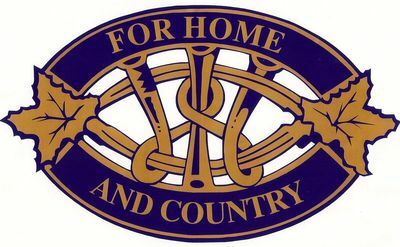 To this day, an annual grant of $700 is received from Central Elgin for ongoing maintenance.